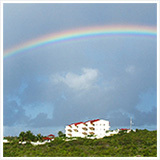 Welcome to Pure Anguilla! 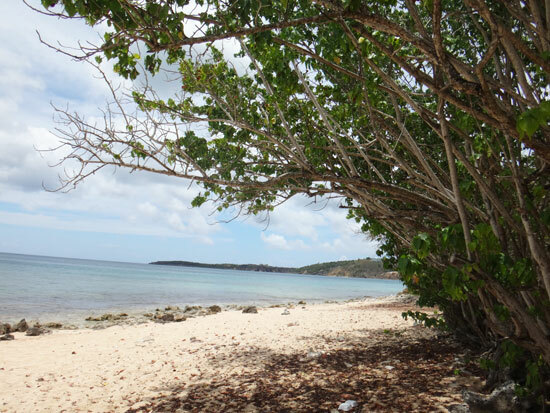 Established in 2016, Pure Anguilla are promoters of preserving and sharing Anguilla’s natural treasures and archeological history. 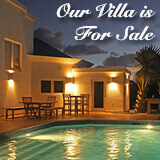 Falling under their brand is a unique and versatile villa located on the highest point in Anguilla, on Crocus Hill, called Viewfort Estate. The original part of that home dates back over 200 years. 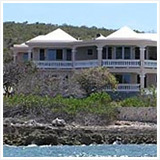 They also own the property that is around two of Anguilla’s most majestic areas, Katouche Bay and Little Bay. 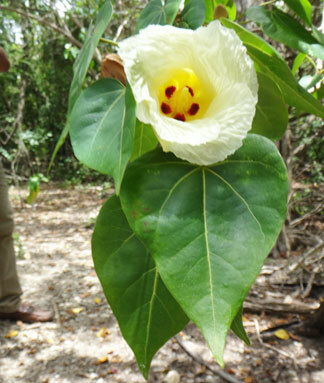 Newly and firstly available as a Pure Anguilla activity is hiking and exploring the caves of the Katouche Valley. 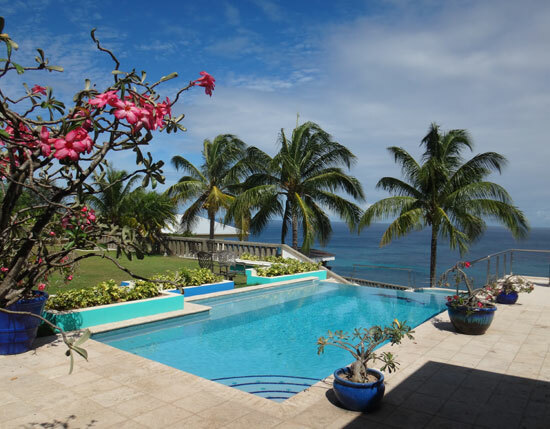 I had the pleasure of taking both of the two cave hikes Pure Anguilla offers AND got a glimpse of their home base, Viewfort Estate. Before I break down the day with Pure Anguilla, let me address the “elephant in the room.” Anguilla locals and regulars are likely to be aware of Pure Anguilla's recent land restriction around the Katouche Bay area - an area of land previously unsigned and explored more freely. I can presume many felt like I did when I first saw the “No Trespassing” signs up along the Katouche Valley and the beach. 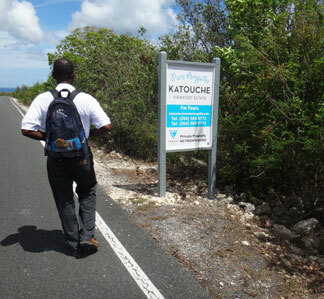 Having hiked through Katouche a handful of times with a friend or two, I felt sad to have that freedom taken away. The walk-in cave, called Cavannagh Cave is a unique spot and the rewarding hike to the beach after seeing it is a brilliant way to spend a day in Anguilla. The morning I was to take the Pure Anguilla tour, I went with an open mind knowing that they 100% have a right to maintain their land, put signs up, deny access to it and protect it. They had shared it for so long and I am thankful for having explored it on my own over the years. 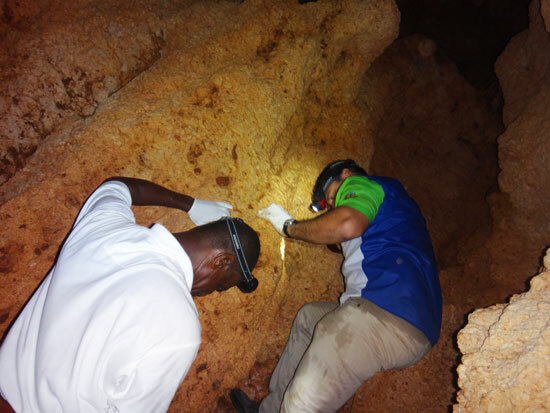 First, did you know that archeologists have determined that the caves in Anguilla are among the oldest in the western hemisphere? 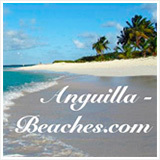 To me, that’s reason enough alone to be drawn to Anguilla, forget the plethora of perfect beaches and tremendous dining. 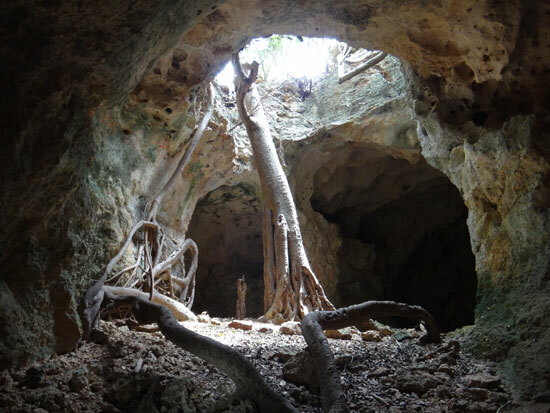 The Fountain (cave - on Shoal Bay East) is the better known underground cavern and has been more heavily studied of the more than 40 caves in subterranean Anguilla. It is special to get to explore any of them in a safe manner and it’s important that they are protected. 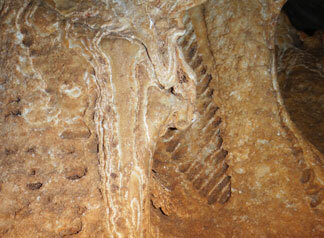 They hold stories of the past; fossils, petroglyphs and are an all-encompassing science class. 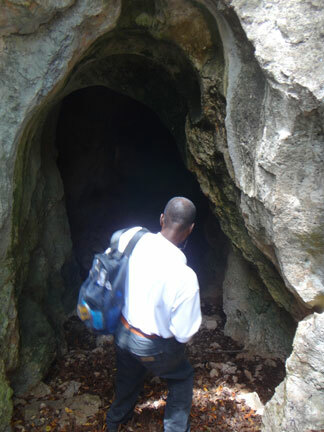 The more freely accessed and more historically accessible caves in Anguilla are those of the Katouche Valley. In more recent years they have become more heavily visited and unfortunately more heavily damaged and even defaced. Crystal that has taken hundreds of years to form including magnificent stalactites and stalagmites are being broken off and taken. 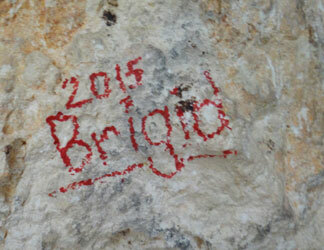 People are also making efforts to glorify their presence in the caves with graffiti of the non-artistic kind with boring names and dates, some scratched in to the surfaces and some written quite brightly. So what’s wrong with that? Time can and will fade the names, although weather doesn’t much since the area is mostly protected from the elements. But, there is a lack of respect for the history and delicacy of the caves and that level of respect has been getting worse. 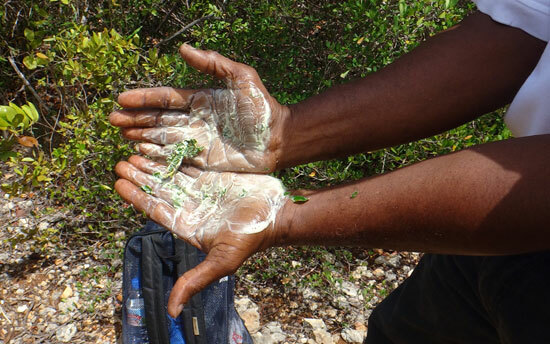 Back to the topic at hand, Pure Anguilla is not only protecting the caves now, they are allowing guests to still see them and that’s a pretty great scenario. 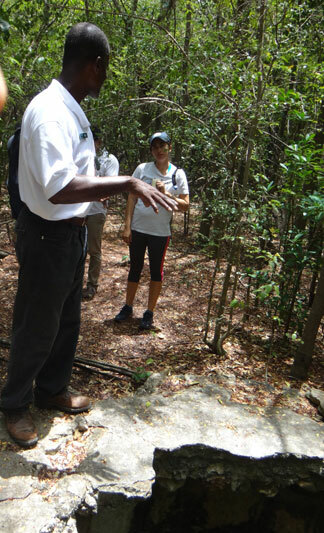 They also have the best guide in Oliver, who knows the land, the plants, the caves and is an easy-going and calm man. 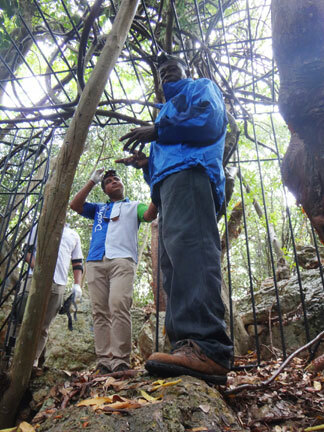 He is the ideal person to guide you through the Katouche Valley and its caves. Oliver pointed out so many things I never knew and all of them interesting if you appreciate nature. 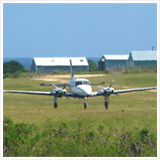 So here we go… Off for a day with Pure Anguilla! After our hikers, a group of 5 including myself and Oliver, congregated, we headed into The Katouche Valley on foot and in the gradual, downward direction toward Cavannagh Cave. We had been given a bottle of water and a light that could be worn on our heads or in-hand as a flashlight. 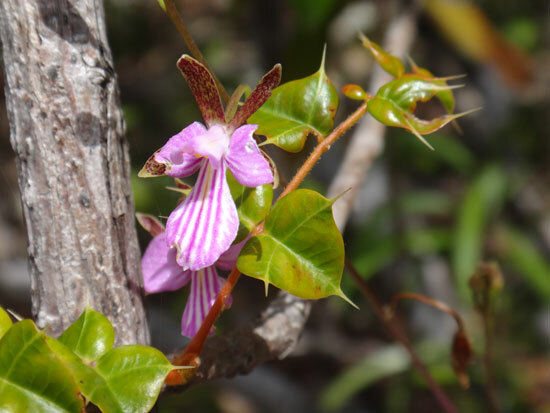 Before we even stepped more than a foot from the paved road and into ruggedness, Oliver pointed out a bush called balsam bush and explained its many uses. 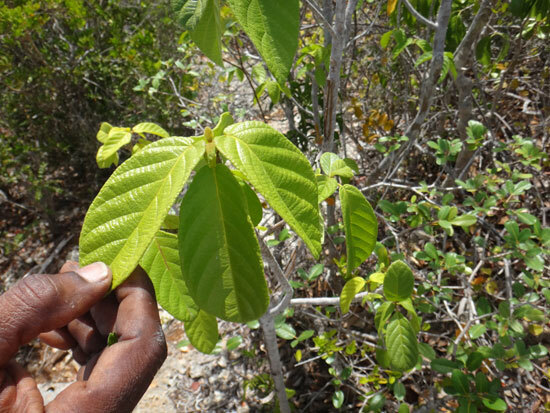 The balsam bush, besides many more useful purposes, was used in the past by Anguillian women to color their nails for ceremonies such as weddings. 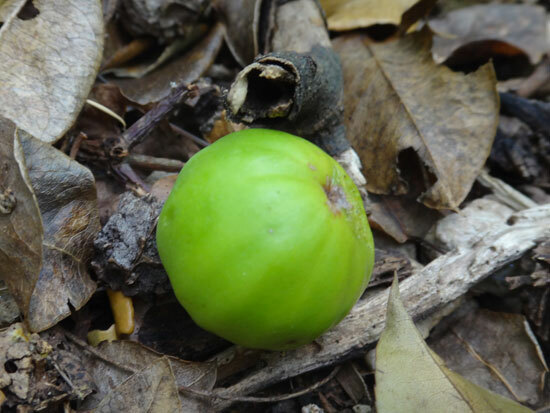 Oliver pointed about plants that were used for brooms, to treat fever, cramps, kidney stones, and even one whose leaves could be used as a lint remover. 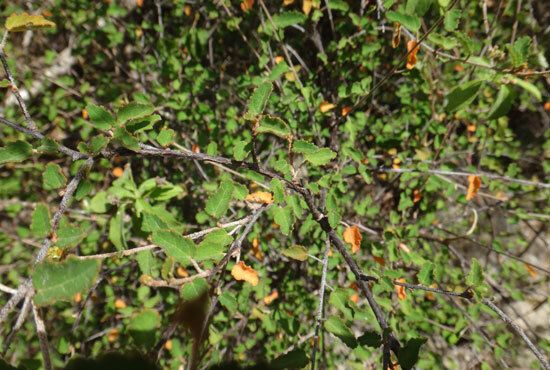 He showed as a bush with edible berries, which we tasted and he pointed out plants to avoid. Fortunately, there weren’t many of those. As we walked, Oliver also pointed out places to practice extra care, like with walking over loose leaves, loose rock and encouraged us to not feel hurried. He was a pro and we had just begun. ...can make the most durable broom you've ever owned! When we reached the cave he unlocked the black metal gate at the cave's opening. 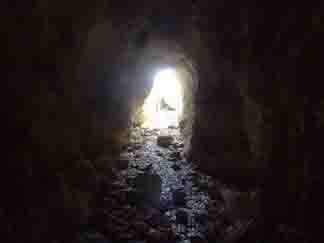 One by one we inched by the only narrow passage that leads inside the cave. Once inside, the head room was plentiful and the light was good enough that you didn’t need your flashlight - unless you want to look at something in detail. 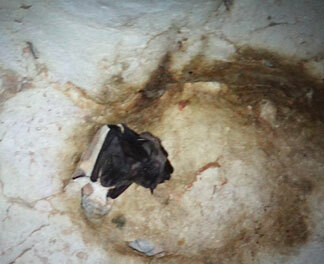 Bats hung overhead and moved around a little, likely due to our presence. 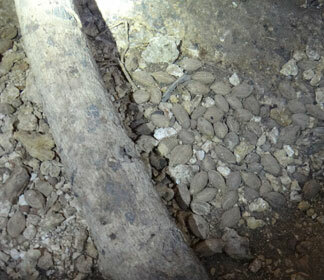 Note: I’d noticed a guano smell in the past but on this day it was not as strong. I’ve never found it too intrusive of a scent to my already sensitive nose. We made our way to the central part of the cave where a fig tree grows from inside the cave and up through a hole in the top of the cave. It is wide enough so you can see plenty of daylight and blue sky. It’s a special and resilient sight. We saw the areas used in the 19th Century for phosphate mining, which aren’t obvious to an untrained eye. Oliver walked us in each direction and noted all of the almonds on the cave floor that were brought in for food for the bats. After spending a little time looking around and asking questions, we headed out of the cave and down the path in the direction of the beach… the longest part of our hike. Oliver had us step off of the path once and over and on to a rocky ledge that was a perfect scenic vista of the Katouche Valley. I had not seen it like that before and was very excited to see the shape of the valley, the bay and you could even see Sandy Island from there. 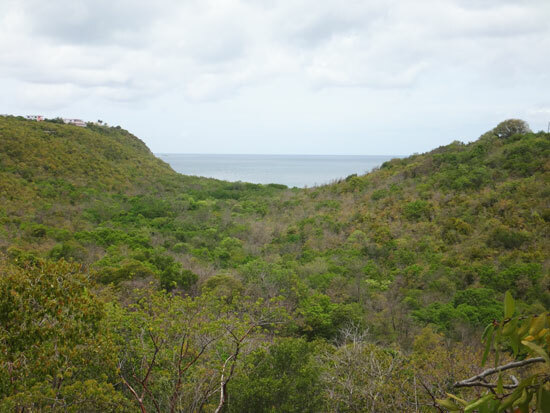 It was surely the greenest vista in Anguilla. We got back on the path and headed down toward the flatter half of the hike observing and learning along the way. We saw bromeliad plants and Oliver told us how even on the hottest, sunniest day, the water within the bromeliad stays cool. 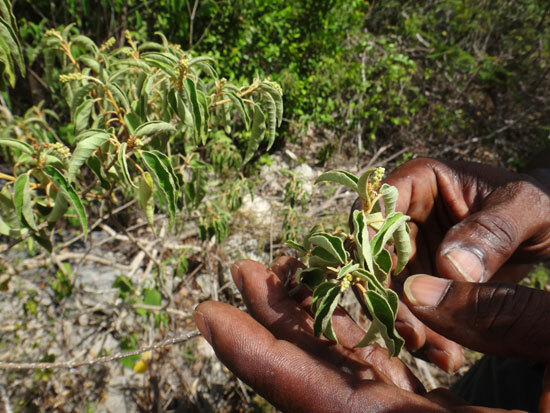 He pointed out the doodledoo cacti and the main tree in Anguilla to avoid, the manchineel tree. Along the way, Oliver shared a little history. The early name of the area was Latouche because of the presence of an invading French commander whose last name was the same and who was reportedly killed on the beach. Maybe just mispronounced over time, maybe because the area has caves and the “K” sound is more appropriate than an invaders last name. 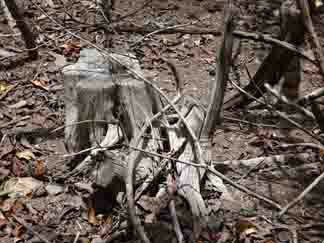 Toward the end of the hike, we saw the remains of an old plantation's well which is still very much in tact. The plantation home it belonged to has been destroyed over time yet the stones from it are in piles and scattered around the well area. 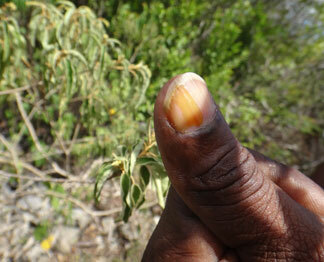 As we neared the beach, the visuals change from less green to dryer and more brown. Large land crab holes are all around the ground and stumps of old trees are visible. Oliver said those stumps belonged to trees used a long time ago for building homes and today, the wood stump is so hard and solid it’s difficult to drive a nail through it. We knocked on the stump and could almost sense its stoutness from the sound. 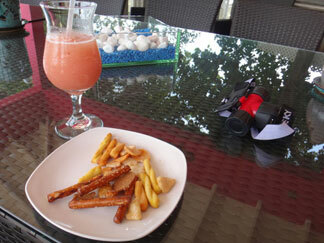 We emerged on to the beach complete with its white sand, looming cliffside and the mesmerizing sound of the ocean. It was a nice finale. Our group walked to a shady spot and before we got in the transportation that would take us back to the villa for a refreshment snack and drink. 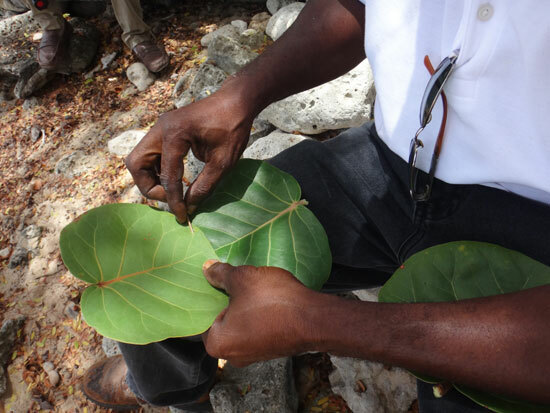 Here, Oliver showed us how to make a seagrape leaf cap. He used 3 large seagrape leaves from a tree on the beach and the stick from a palm frond. It took him just a few minutes and it was pretty. 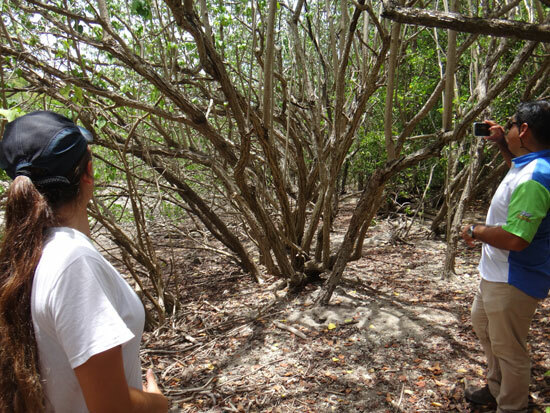 He said it was something many Anguillians used to make and use as a bowl to gather berries, shells and he said if you’re caught outside and need to protect your head from the sun, it makes a nice cap. The next one was to take between an hour and half to two hours, depending on how deep into the cave you go. We were transported a couple of minutes down the road and were at the entrance to the cave. This time we were once again equipped with a bottle of water, our head flashlight and for this hike, elbow pads, knee pads and white cotton disposable gloves. When you fill out your paper work and sign releases, Pure Anguilla asks about your physical health and if you are claustrophobic. This hike requires more crouching, squatting and little bit of crawling. You are also completely underground the entire time and cannot venture off on your own since there are many twists and turns and one could very easily get lost. Knowing all of this, I could not wait to see what it looked like underneath my favorite island. Loving history and exploring, this was a perfect combination of both. Oliver led the way and gave detailed instruction on what to do and how to be. It is easy to bump your head and he points out the key areas where your risk is higher for doing just that. 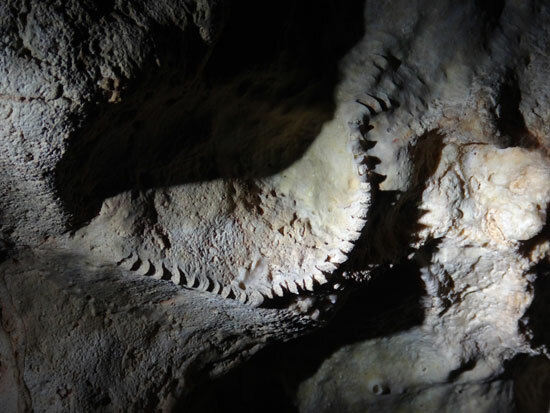 We spent time using our head flashlights to look at fossils in the cave walls and point out things we saw that could be something real - or imaginary. We saw shells, cat faces, sea urchins, things that looked like jaws. 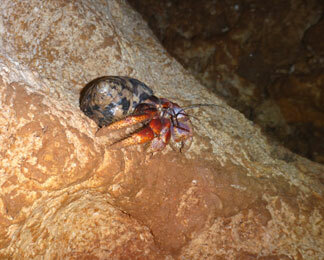 The only living creatures we saw in the cave were spiders (I saw 2), roaches of a decent size (I saw about 8 -10), a few bats and soldier crabs. 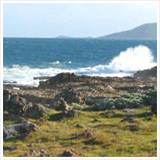 It was without a doubt, the quietest place on the island. Without our lights, it was the most pitch black environment I have ever been in. Oliver had us all turn off our lights at the same time and wave our hand in front of our face - nothing… no hint of movement could visually be detected. It was a strange and cool altering of the senses. With the lights back on, Oliver took his red and white light and shined them on a wall of the cave to show us the light going through crystal. 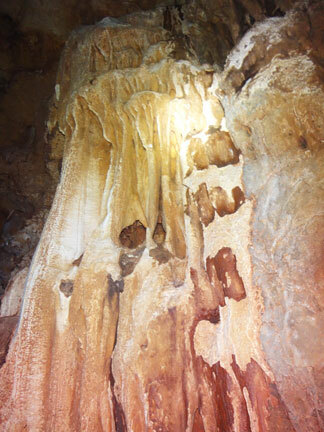 Without the light, that wall of the cave looks like the neutral, warm toned color throughout. As we kept going, Oliver reminded us how deep we were below ground. He said, you don’t notice since its gradual, but we were down to about 180 feet under ground. 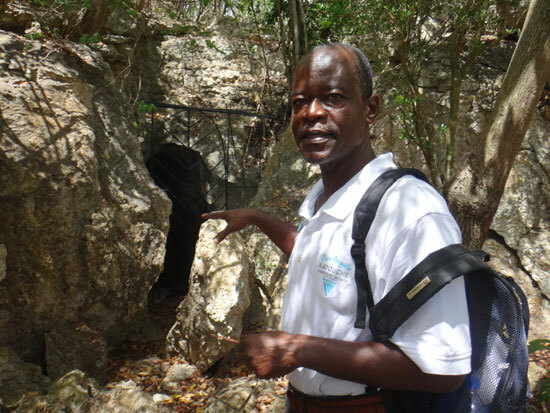 Oliver showed us where water used to flow through the cave even as recently as 2005. He knows the cave well and maneuvers through it in some places like, as I told him, a lizard. The hostesses back at Viewfort Estate had told our group that Oliver goes in the cave with a white shirt on and comes back out with hardly any dirt on him. I can confirm this. I can also see why they provide you with the gloves to keep your hands clean. 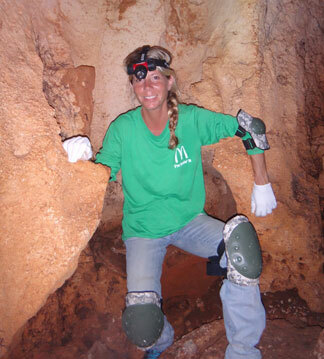 The knee pads and elbow pads weren’t vital, like the head flashlight, but they are nice, protective bonus for the areas with loose rocks where you crawl. 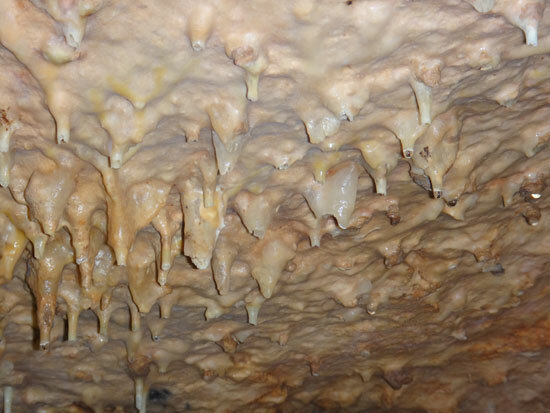 Nearing the second half of the cave exploration you’ll see newly forming stalactites. You'll also see the most talked about fossil native to Anguilla - the now extinct Amblyrhiza Inundata, also known as a blunt-toothed giant hutia and in layman’s terms, a huge prehistoric rat that weighed between 100 and over 400 pounds. They’re described as a rat the size of a small deer. 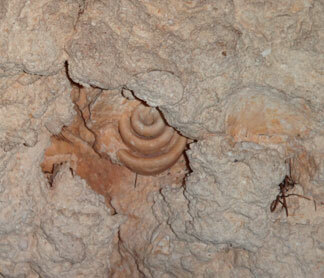 Fossils of them have been found in Anguilla and some were destroyed by the phosphate mining. 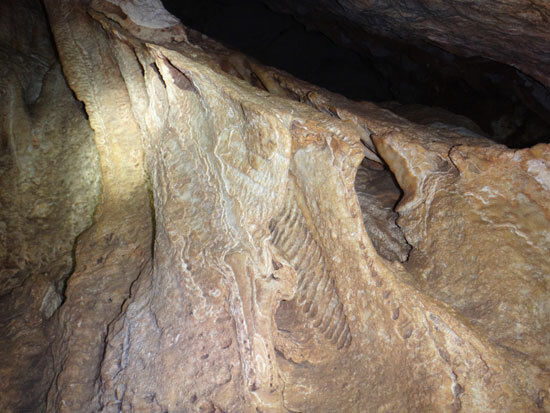 One can be seen on the hike of Katouche cave, with the rear, left leg bone being most apparent. It’s been a while since I was in school, so for me, it was like dipping back in to my memories of science class and something I wish everyone could see. There was something interesting to look at the entire time and Oliver told me he still sees something new each time he goes in to the cave. I believe that! I enjoyed every minute of it and found one spot I didn’t want to leave, I just wanted to keep looking at it. It reached so high up and seemed to keep going until I couldn't see it. 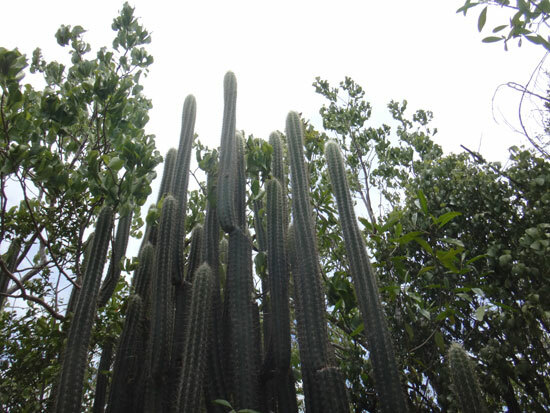 Oliver said it looked like organ pipes. The time in the cave was beautiful and strange. I had forgotten about the above world and time seemed to stand still while I was down there. That doesn't happen often! It was a wonderful experience. When we emerged back into the fresh and moving air, the humidity decreased and even though we’d had a full day of hiking and cave exploring, I felt refreshed and thankful. 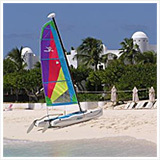 Pure Anguilla and Oliver have created a special experience that is sure to be a highlight for anyone with an adventurous spirit and an interest in exploring nature. 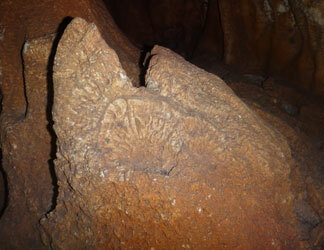 The hike was beautiful and educational, the cave was haunting (in a good way) and it was all very interesting. The entry in to the Katouche cave is the most intimidating part since you don’t really know exactly what’s ahead of you for the next couple of hours. Soon after we got in, those feelings of uncertainty disappear and you are mesmerized by the unusual and historical surroundings. I loved the full day of Katouche and I got to know it much better than I thought I did. 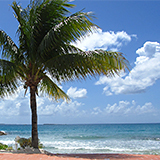 Oliver knows so much about Anguilla in general and is easy to talk about about everything from the flora and fauna, to the history of the land. His love for the cave is clear and I felt 100% safe and content the whole day. If you don’t mind a little exercise, being outdoors, in the woods, surrounded by rock and don’t mind getting a little sweaty and dirty, you can handle either or both cave hikes. I should also note that I’m middle-aged and do not exercise beyond walking my dogs and did just fine with any of the physical demands of both hikes. 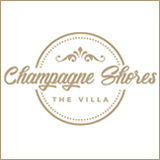 The folks at Viewfort Estate are as nice and hospitable. And, Oliver is the ultimate guide. 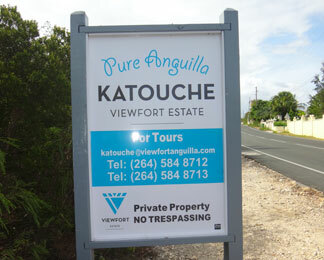 If you love Anguilla and thought you couldn’t love it any more, check out Katouche with Pure Anguilla. What to Bring? 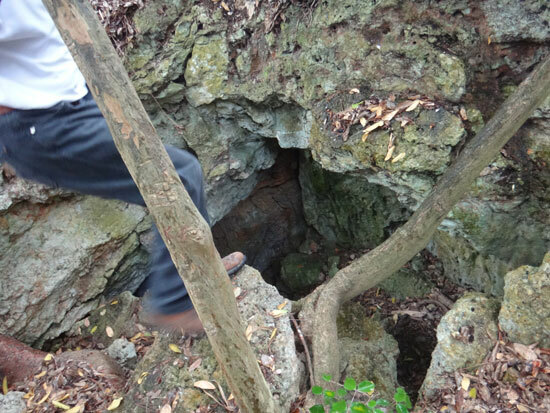 I wore jeans, socks, tennis shoes with good traction, a sports bra-type tank top and I had a long sleeve t-shirt that I had around my waist until we entered Katouche Cave. A long-sleeve t-shirt is also good to bring in case you want to keep dirt off of your wet skin (due to humidity). The only other thing I had with me was my bottle of water and my more rugged, waterproof camera. 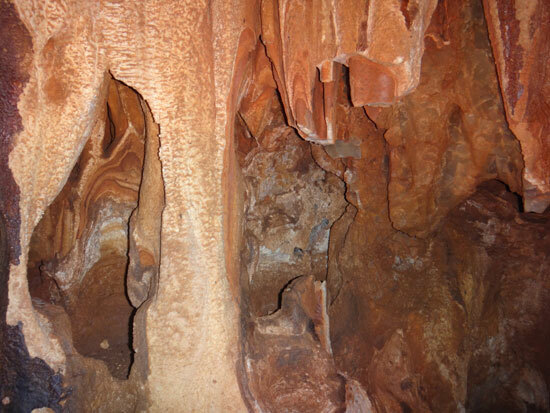 Pricing: Guests wanting to experience the hike and Cavannagh Cave can do so for $75 US per person. 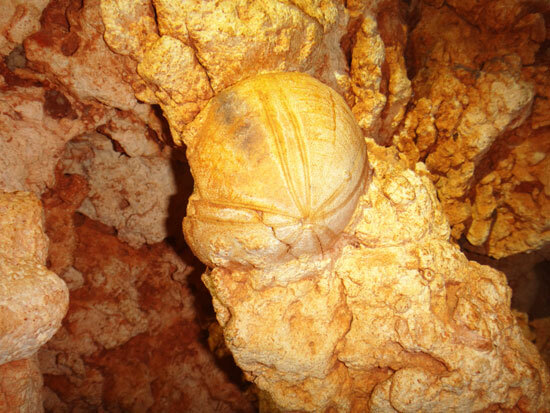 If you want to explore Anguilla’s underground, Katouche Cave, it’s $150 US per person. 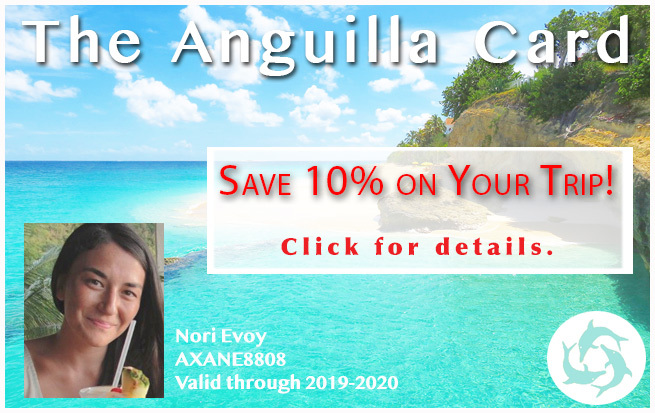 Pure Anguilla is in the process of finalizing the details of officially offering a full day of both cave tours and the hike through Katouche Valley, complete with a lunch (and that fantastic homemade juice) at Viewport Villa. 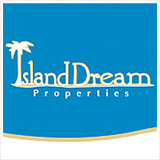 Keep an eye on their website or contact them for those details.